A marketing funnel describes your customer’s journey with you. From the initial stages when someone learns about your business, to the purchasing stage, marketing funnels map routes to conversion and beyond. With careful analysis, a marketing funnel lets you know what your company must do to influence consumers at certain stages. By evaluating your funnels, you can potentially drive greater sales, more loyalty and stronger brand awareness. Awareness: The prospect is aware of their problems and possible solutions for them. Interest: The prospect shows interest in a group of services or products. Desire: The prospect begins to evaluate a certain brand. Action: The prospect decides whether to purchase. The basics of the marketing funnel have stayed the same since the 1900s. However, no single model is universally accepted by all companies. Some prefer to keep their model simple, using the “TOFU-MOFU-BOFU” strategy which refers to the top of funnel, middle of funnel, and bottom of funnel as distinct elements. 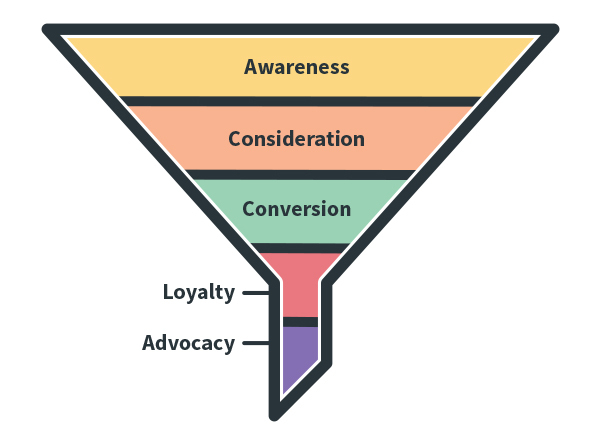 Others believe that adding “loyalty” and “advocacy” stages to the funnel improves the marketing strategy. After all, businesses lose up to $1.6 trillion a year when customers leave them. Awareness: Branded content strategies appeal to audiences and make them receptive to future interactions. Consideration: Brand advocates and social proof assist customers when they’re comparing you against competitors. Conversion: A simple purchasing process reduces the risk of buying. Loyalty: A loyalty program with regular discounts, email interactions and social media maintains customers. Advocacy: Receptive individuals in your loyalty program support your future marketing funnels. Marketing funnels simplify the customer journey and make it easier for companies to follow. These solutions map out each stage of their client’s decision process and plan the steps they want to take in each. A marketing funnel applies to almost any customer interaction. Whether you’re looking for online sales, generating traffic for your brick and mortar store or collecting clicks as an affiliate, you need a marketing funnel. The funnel is powerful way to bring visibility to every stage of connecting with your customer. The biggest benefit of marketing funnels is their measurability. Your funnel shows you where you’re losing customers, to help you pivot your strategy. For instance, if you lose customers before they ever get to the second stage, you need a better brand awareness campaign. Marketing funnels often change depending on your customer base. B2C customers often navigate the funnel alone or with trusted advisors like family and friends. B2C clients may never interact directly with a company representative. B2B customers have larger, more focused buying groups. B2B consumers interact directly with sales representatives in the lower stages of the marketing funnel. Adjusting your funnel to suit your user personas instantly makes it more effective.